Available on Blu-ray™ and Digital for the very first time, Superman The Movie: Extended Cut can now be enjoyed in widescreen high definition, along with the Special Edition in one collection! Superman The Movie: Extended Cut, the TV version of the film originally aired in 1982 as a 2-night special in the U.S., includes nearly 40 mins. of extra footage not seen in the 1978 theatrical release. 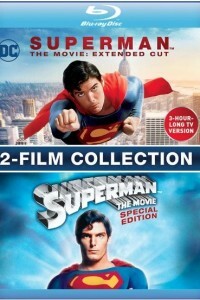 The legacy continues in the Special Edition, a captivating version of Superman The Movie with 8 mins. of extra footage, specially directed by Richard Donner.